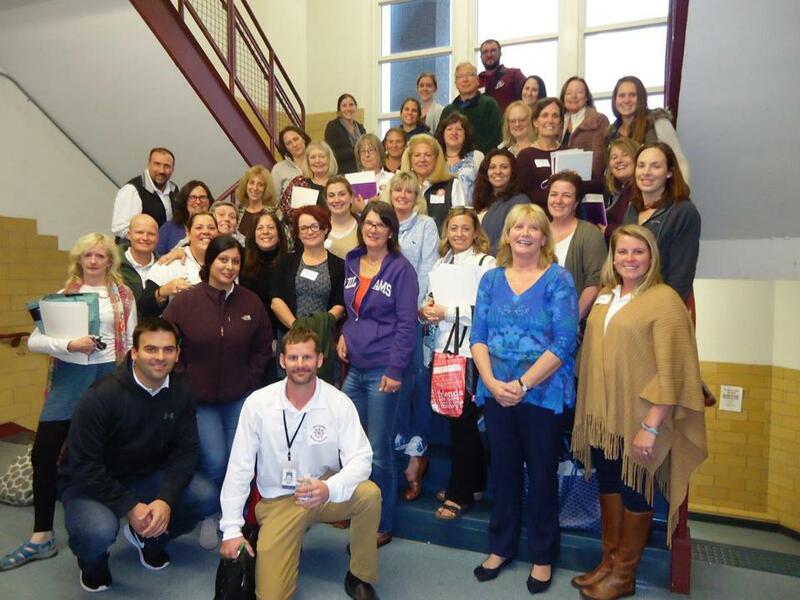 Nickey Mullen of Lahey Health (front row, second from right) led training at the school in mental health first aid. Here’s the scenario: A bright student’s grades are slipping. She’s been missing class, and when she does attend, she’s more withdrawn. Something is wrong — and a teacher, staff member, or administrator has noticed. But what’s the next step? Questions like this took center stage at Gloucester High School as 90 members of the school’s faculty, staff, and administration participated in Youth Mental Health First Aid Kit certification training. Mental Health First Aid, a concept originating in Australia, is run by the National Council for Behavioral Health. The program offers eight-hour courses that teach ways to help others deal with mental health crises the way CPR teaches how to react to heart attacks. James Cook, Gloucester High principal, said there are an abundance of mental health resources in place. The school offers counseling and referrals through its health center, a collaboration with the Massachusetts Department of Public Health and Addison Gilbert Hospital. It also has an adjustment counselor — a kind of in-school social worker — on staff. “This training was really about educating teachers on their potential role on first contact with students,” Cook said. Nickey Mullen, employee assistance program director for Addison Gilbert parent company Lahey Health and a certified Mental Health First Aid instructor, led the training in Gloucester. She said the workshop — through vocabulary lessons, role-play scenarios, and group discussion — teaches participants how to make students comfortable enough to talk about their mental health, and how to respond as a first point of contact. The Gloucester High gathering was broken into small groups and each given a scenario to focus their discussions. They talked about how to gain the trust of students in crisis, and what resources should be used to help. Cook’s group addressed the withdrawn student. Later in the training, his group found out the student had a parent or guardian struggling with substance abuse, and were tasked with identifying the next step. Samantha Teixeira, the school’s library teacher, said the environment at Gloucester is very supportive, but it’s often hard to advance a situation when a student is in crisis. Cook said that the feedback to the program has been positive and the training provided school employees with a common language and experience they can fall back on when dealing with mental health situations. He said he’d like to revisit the training in the future. Laura Elyse King can be reached at laura.king@globe.com. Follow her on Twitter @lauraelyseking.